You always know when the dogs are eating at our house. Those stainless steel bowls on the tile floor drive me crazy! When we have extra pups to feed, they end up chasing their bowls around the kitchen, especially the labs that act like they haven’t eaten in a week! Then we received the PetWeighter Bowls and things are so much quieter and easier and those labs even eat slower! What is a PetWeighter Bowl? PetWeighter is an award winning, pet bowl that prevents your pet’s food and drink from travelling around the room! Simply fill the base with sand or water (or both!) and place the bowl on top. 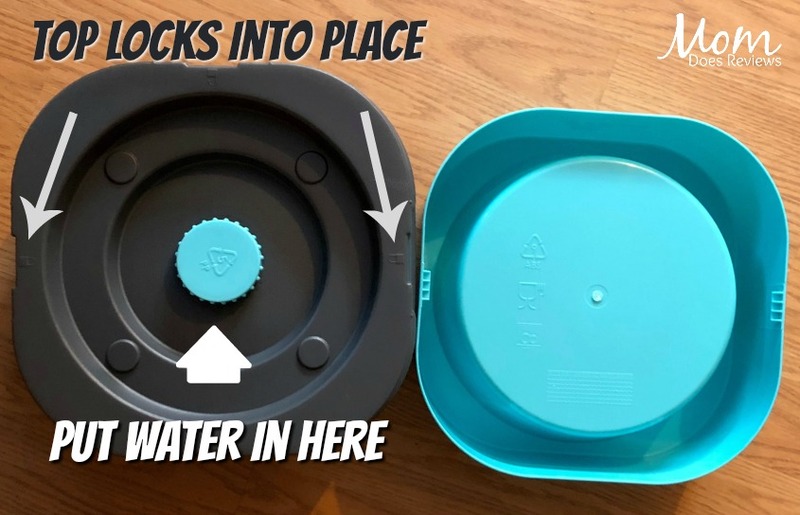 The bowl locks gently in place and is easily removed by human hands for filling and cleaning. No more soggy socks! No more moving meals! 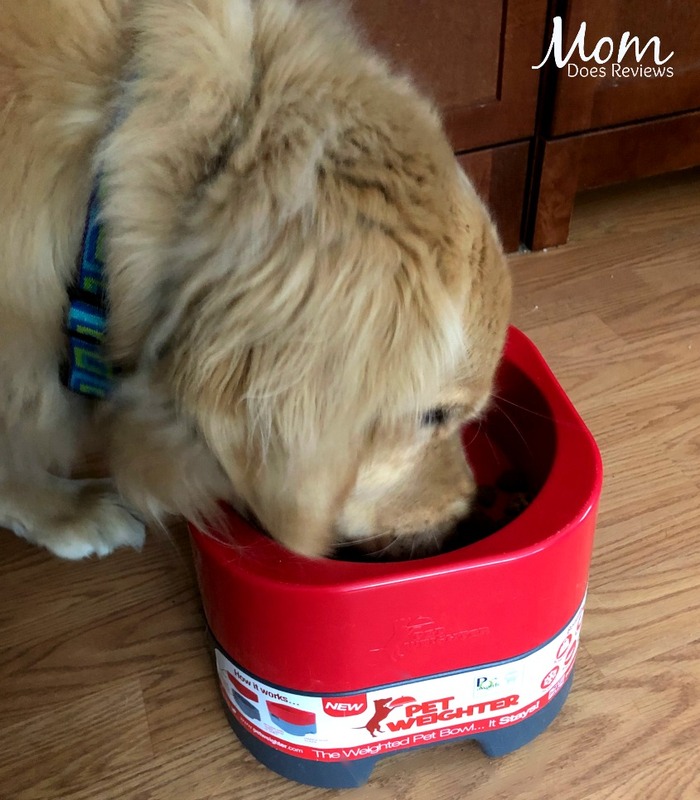 A bowl that stays put is not only convenient, but PetWeighter feeding solutions may also aid pet’s digestion and joints. It’s Sturdy & Secure: The PetWeighter® has a base, and a bowl that locks onto it. It removes easily from the base for filling and cleaning. The base can be filled with water, sand and water, or ice, to give it a weight of up to 28 lbs. In New Hampshire, we didn’t have access to any sand, so I just used water. When the bowl is placed back on the base, pups aren’t able to move the bowl around or knock it over to spill their food or water. What’s more, they no longer have to chase their bowl around to eat! Dogs can eat Slowly! 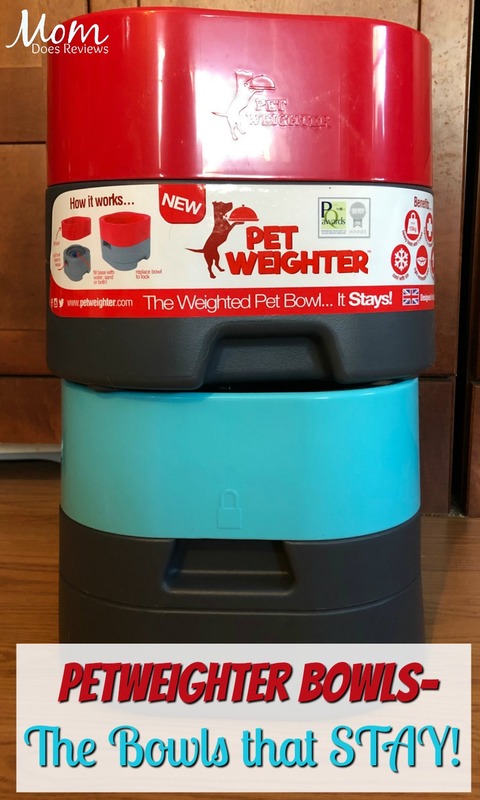 PetWeighter® have developed an anti-gulp bowl to encourage a reduction in the speed at which pets eat their food, which is better for their digestive system . Keeping the bowl in place may also help with slowing down a speedy eater! I noticed a huge difference when feeding one of our Lab campers! She always chases the bowl around and inhales her food. With the PetWeighter Bowl, she eats slower and even more lady-like! Elevated Feeding Position: The elevated eating position may help improve your pet’s digestion and can also be easier on their joints. Both digestion and joint complaints are increasingly common complaints by pet owners. Elevated feeding is often recommended by vets and other pet owners. It’s Light & Easy: The bowl is light and easily detachable from the base so it’s effortless to fill or clean. I love that I can just rinse it out or throw it in the dishwasher! 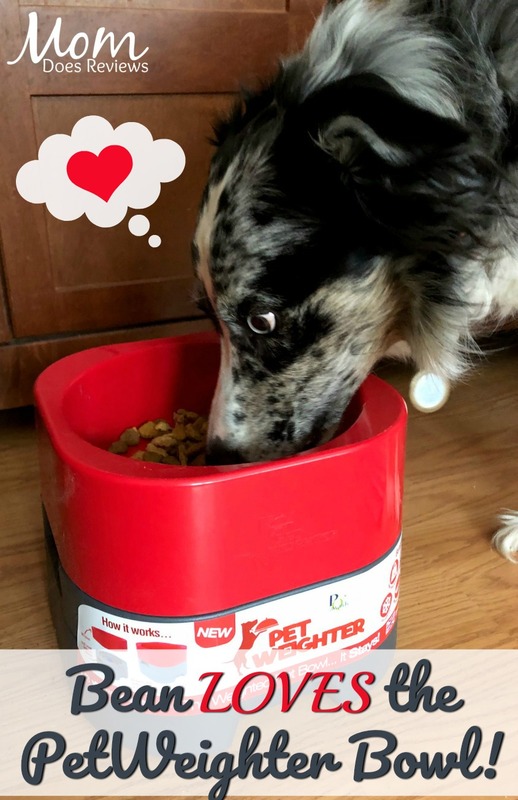 It’s Hygienic: The PetWeighter® is designed by healthcare engineers with hygiene in mind to ensure that the bowl has no cracks and crevices that will attract dirt. The PetWeighter® will also stay where you put it which will help establish a dedicated pet feeding area in your home. No more cleaning the whole kitchen after your pup eats. The PetWeighter Bowl is one of my new favorite pet products! Not only is it easy to use, it’s relatively inexpensive and it solves 2 main problems in our house- noisy feeding time and fast eating pups. No more chasing bowls around the floor at feeding time- no more food inhalation! It has made a big difference for the Labs we feed. I also love that it is just one bowl. We have a few raised diner bowls, but they are all double bowls. 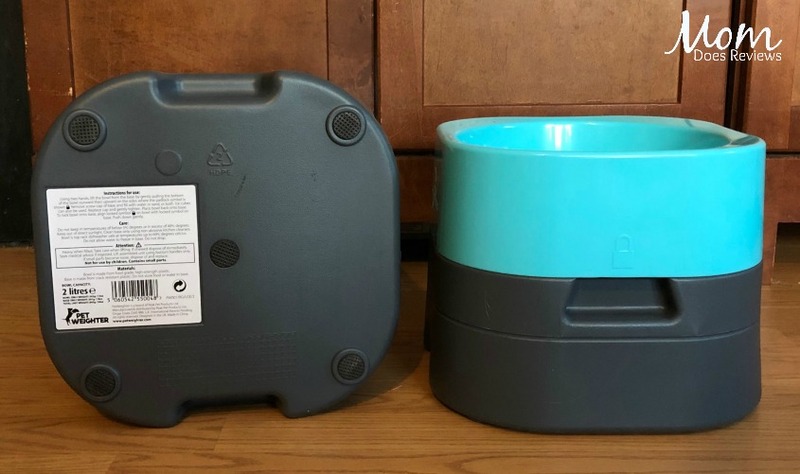 We have a huge watering station for our pups, so we only feed them out of the raised diners, they don’t get a “water bowl” too. One main reason is the amount of water sloshing all over the place while pups are playing or even eating. Now we can feed one dog in one spot in our kitchen and not have to worry about spills and messes. 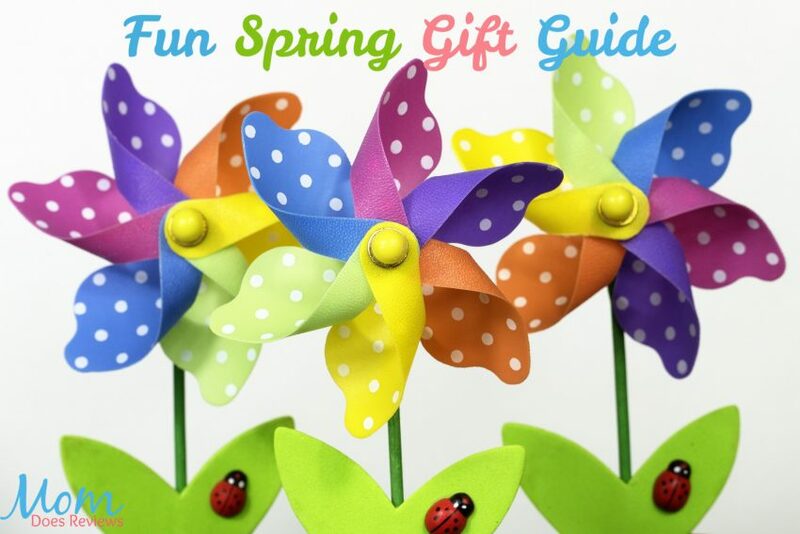 We have added PetWeighter Bowls to our Fun Spring Gift Guide!